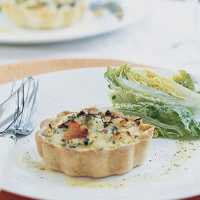 These delicate tartlets need only lightly dressed salad leaves as an accompaniment. Preheat the oven to 200°C, gas mark 6. Unroll the pastry on a lightly floured surface and gently roll out with a rolling pin to make a larger and thinner pastry square. Cut into 4 smaller squares and use these to line 4 x 10cm-wide (4cm-deep) individual fluted tart tins, gently pressing the pastry into the base and sides. Prick the bases with a fork and chill for 20 minutes. Line each tartlet with baking parchment and fill with either baking beans, dried beans or rice grains to weigh down the pastry when it is being part-cooked and stop it from rising. Bake the pastry shells on a baking tray for 15 minutes until very lightly golden. Meanwhile, melt the butter in a frying pan and gently fry the salad onions and chilli for 2–3 minutes until softened. Remove from the heat and allow to cool. Tip the crab meat into a bowl and add the onion and chilli mixture along with the cream, egg yolks, coriander and lime zest. Stir well and season to taste. Remove the paper and beans from the pastry shells and spoon the crab mixture into the tarts. Bake for 20-25 minutes until very lightly golden on top and the filling is just set. Serve warm with Little Gem lettuces cut into wedges and drizzled with a light salad dressing. As an alternative to fresh crab, you could use 1½ x 170g cans John West White Crab Meat.